This Monday, February 17th, is Random Acts of Kindness Day. It’s a day for reaching out and making someone’s day a little brighter. Rose Bud Butter Cookies add sparkle to any occasion. These flaky pastry cookies are enclosed in a crunchy sugar coating, then folded into piles of buttery goodness. The original Russian recipe calls them Crow’s Feet (gusinie lapki), but they look more like rose buds to me! The richness of this cookie comes from the butter and an unusual cookie ingredient, cottage cheese. The small curds of the cottage cheese disappear into the dough while baking and make the layers of cookie flaky and moist. This recipe uses the zest from one lemon to add a gentle whiff of citrus, perfect for enjoying with a cup of tea. I think vanilla extract or orange zest would be tasty variations. The only change I made to the original recipe was in the sugar coating process. Traditionally, only one side of the dough circle is pressed in sugar and the sugar coated side is always folded to the inside. The result is a cookie without sugar on the bottom. Perhaps, in the days before non-stick surfaces, the caramelized sugar would stick to the baking sheet and make it difficult to remove the baked cookies. Lining a baking sheet with parchment paper makes it possible to enjoy the extra sweetness and crunch from a completely coated cookie. 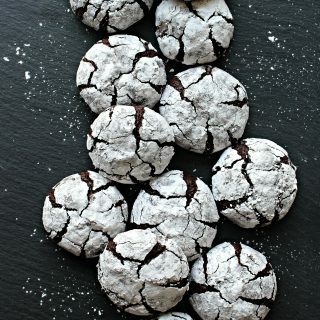 In addition, encasing the dough in sugar keeps the cookie moist and delicious longer. The term “longer” is relative. 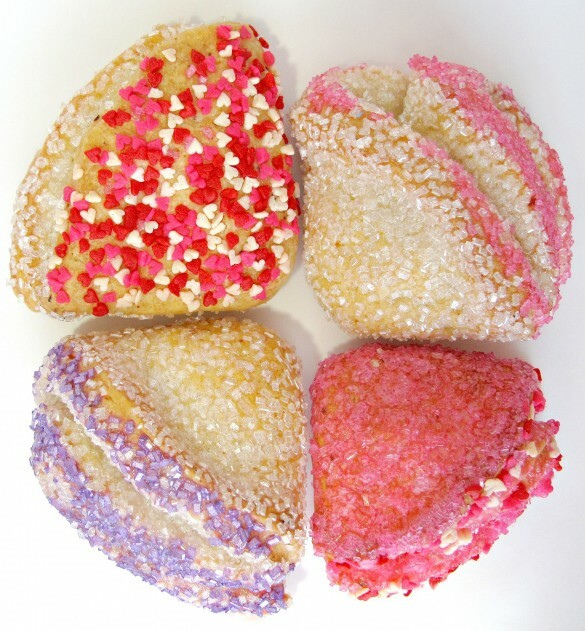 Rose Bud Butter Cookies are flavorful, sturdy short distance travelers. Double wrapped in plastic wrap and stored in an airtight container at room temperature, they will stay fresh for at least 5 days. I do not recommend them for long distance (military) or hot weather care packages. On Monday I will participate in Random Acts of Kindness Day by sharing a Cup of Joe. Last year, I learned from my blogging friend, Gina, at Gina Left the Mall, about an easy and inexpensive random act of kindness called a Cup of Joe that has become important to me year round. Many of the Monday Box recipes are created with the special requirements of military care packages in mind. The men and women who serve their country do difficult jobs in often dangerous and uncomfortable conditions. I am in awe of their commitment and the sacrifices their families make. I was dismayed to learn that many of our military feel forgotten by the very people they are serving. I am not a political person, but as a mom my heart goes out to each soldier and their families. Cup of Joe is a program through Green Beans Coffee which has cafes on military bases throughout the world. Anyone can click on their site and, for only $2, donate a cup of coffee to a service person. There is also the option to write a short message of support to go with the coffee. That random act, from one stranger to another, is so effortless and yet reaches across continents to communicate kindness. I send Cups of Joe on a regular basis and receive thank you emails from the recipients. Just in case you have any doubt that one little cup of coffee can make a difference, I would like to share a few quotes from recent emails. This Monday, join me in celebrating Random Acts of Kindness Day by baking some Rose Bud Butter Cookies and virtually sharing a cup of coffee with a service person, providing a combination morale and caffeine boost. Participating requires little effort yet can have a huge impact. Simple acts of kindness can transform our world. In the bowl of an electric mixer, cream together butter, cottage cheese, and zest until light and fluffy (about 5 minutes). Add the flour mixture to the creamed ingredients in the mixer bowl. Knead by hand or with a dough hook until smooth. If the dough is sticky, add an additional 1 tablespoon of flour. Roll out the dough between 2 sheets of parchment paper until 1/8” – ¼” thickness. Cut out circles using a 3 ½” cookie cutter. Pour sugar onto plate. Press a dough circle gently onto the sugar to coat. Turn the circle over and press gently to coat the other side. Fold the circle in half, then in half again, forming a quarter circle (triangular wedge). Gently press the rounded edges into the same or contrasting colored sugar to coat. Place the cookie on the prepared baking sheet. Use two fingers to gently press across the middle of the cookie to emphasize bud “petals” and to keep the layers of cookie from separating while baking. Repeat with remaining circles. Placed the folded cookies about 1” apart on the baking sheet. Re-roll remaining dough and repeat the cutting, sugar coating, and folding process. Bake for 30-32 minutes, until the edges begin to brown. Cool completely on the baking sheet. 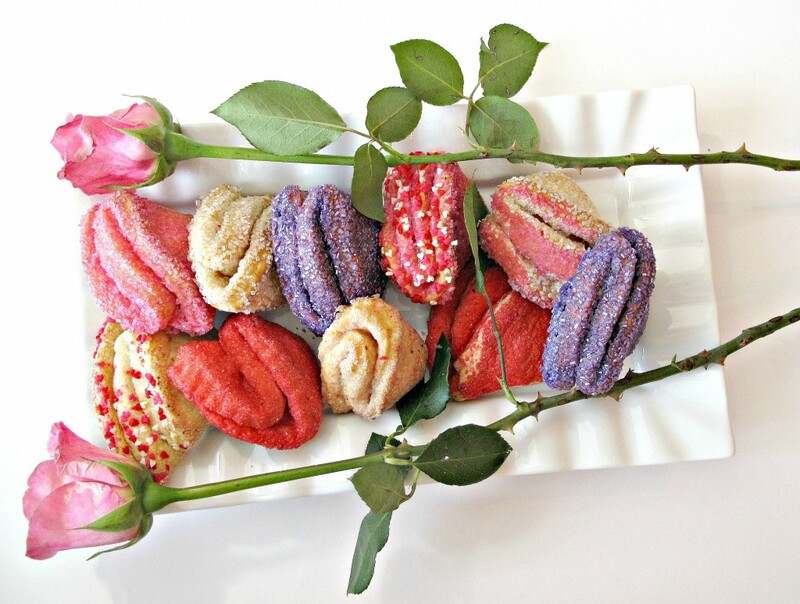 Use plastic wrap to double wrap Rose Bud Butter Cookies singly or in pairs with bottoms together. Place in an airtight container or ziplock bag. Butter cookies are not recommended for hot weather shipping. Would you let me place this on my twitter? Thanks, for stopping by, Mandy Dee! 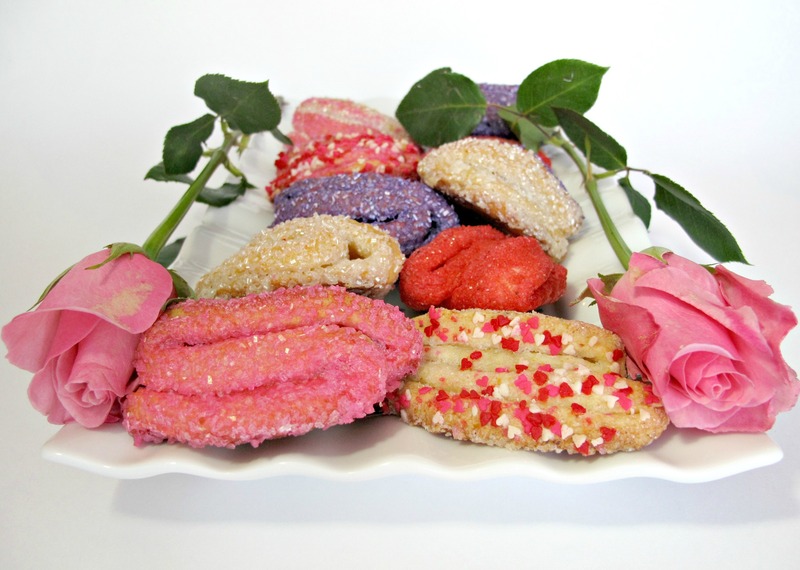 Go right ahead and tweet about Rose Bud cookies. Glad you like them! How fun and pretty too! Thank you, Chris! I love how they taste like puff pastry! Thanks for sharing the info about Cup of Joe – I hadn’t heard about that organization before! 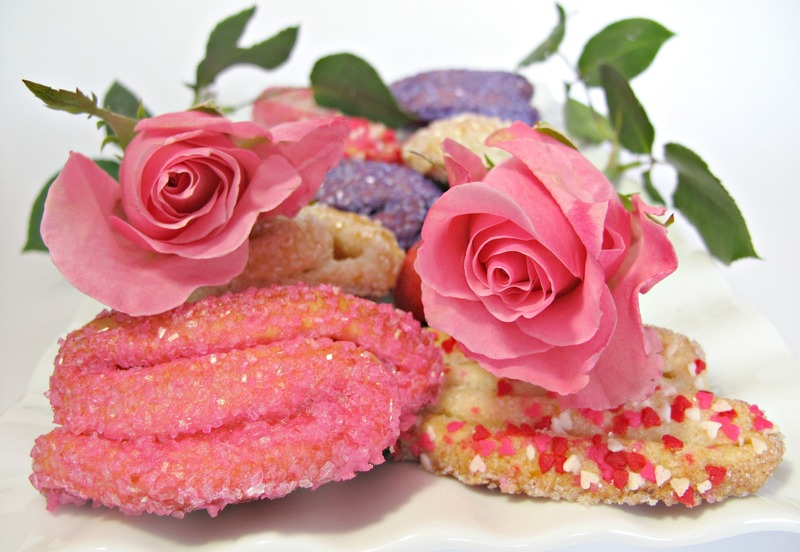 And these rose bud cookies look lovely – and so interesting with the cottage cheese. They sound delicious! Happy Valentine’s Day! I was quite dubious about cottage cheese in a cookie before I tried these but now I am a fan! I happily spread the word about Cup of Joe whenever I can! It feels so good to be able to offer what support I can (with so little effort) assuring our soldiers far from home that they are appreciated and are NOT forgotten. What a pretty cookie. Thank you for sharing the recipe. I found you at Simply Gloria. Thanks, Meredith! I am glad you stopped by! There are so many wonderful recipes at the Simply Gloria’s Show Stopper! Thanks, Julianne! The best part is that they are really easy to make and taste like a butter pastry! OH MY GOSH! How cute are these! I adore butter cookies, never thought to make them at home! These are absolutely beautiful! those are so adorable! and i’ve never seen nor heard of this type of cookie before; you’re right, they look way more like roses than they do crow’s feet. 🙂 so pretty…i like what you did with all the different color combos (i feel a Wee One project coming on). Thanks, Shannon. 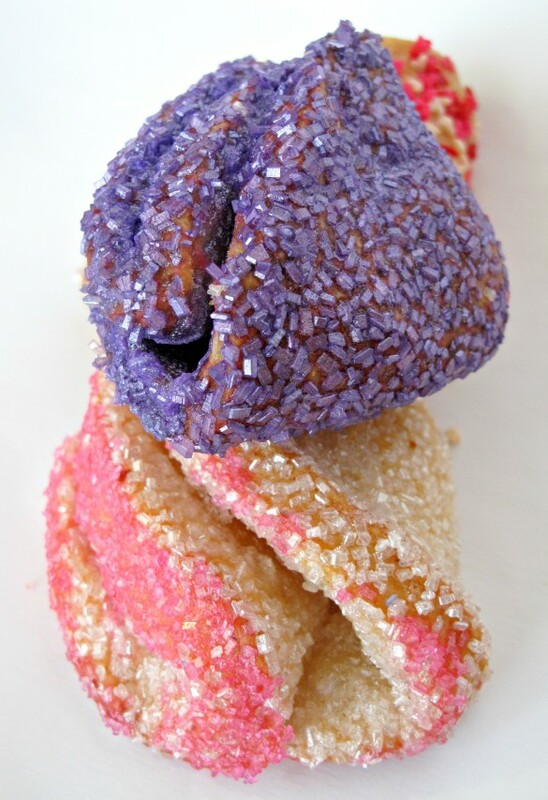 When I first saw cookies from the original recipe (no bling sugar added) I thought they looked like folded up notes….you know the kind that kids pass between desks at school. I was going to call them “Love Note Cookies”. My taste testers made it clear that I was seeing things. No one thought they looked like notes (I still do). The bling sugar takes them away from traditional (who cares?) and gives them a flowery sparkle. 🙂 The sparkle alone should capture Wee One’s attention. Though this is a generalization…pink/purple sparkly= 3 year old girls! Thanks, Reeni! I love reading blogs that feature recipes from other countries. I find so many delicious new favorite foods that way!! These cookies are so easy to make and the finished result is like pastry dough (not at all an easy thing to make!) They just looked like roses to me and decorating was fun! Aren’t these pretty! I think Natasha makes some very lovely things – no wonder you tried these. Thanks, Maureen! I agree that Natasha makes (and photographs) many enticing recipes! Trying “different” things is such fun! Oh My ! How cute they are !!! Simply love it it’s soooo freaking cute ! really !! Thank you so much, Sarah! You are so sweet! Are you baking for your cousin’s bat mitzvah? At our temple, friends and family often bake for the Friday night service and the kiddish right after the bat mitzvah service. 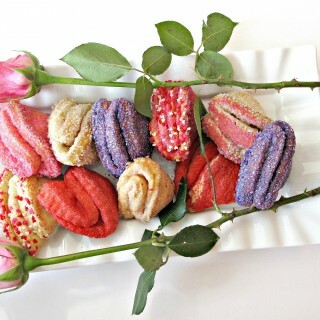 I made trays and trays of cookies for my kids ( color coordinated to their bat/bar mitzvah “color”) I think these Rose Bud cookies would make a beautiful tray for a bat mitzvah or wedding shower! Such beautiful and unique cookies!! Thanks, Winnie! These are a tender cookie made with a easy to work with dough. They started out simple and bloomed into roses when I added the sugar! 🙂 Thanks for pinning!! Thank you, Kriska Marie! Playing with cookie dough can be fun! 🙂 Thank you for the invitation to your link up. I will be sure to check it out as well as read about your life in Dubai! 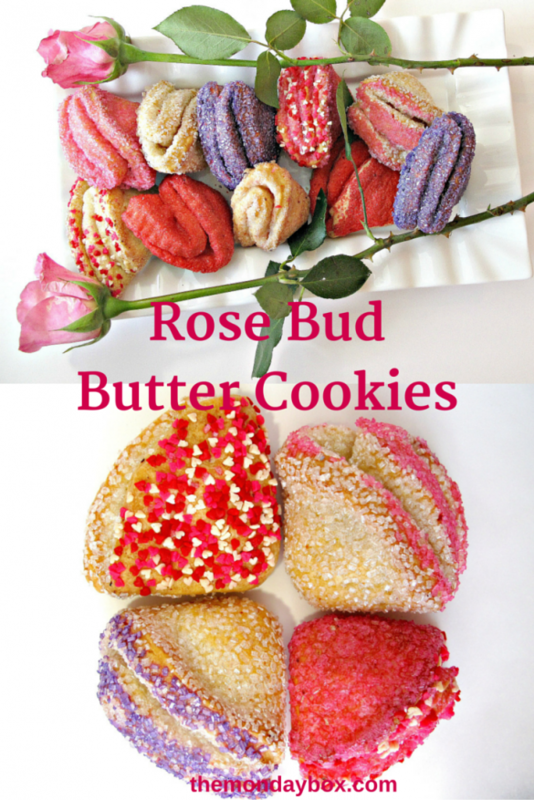 Your Rose Bud Butter Cookies are so special! Hope you are having a great day and thanks so much for sharing with us at Full Plate Thursday. I love these! They are so cute! Thanks for sharing with us at Funtastic Friday! Thanks, Debra! Thanks for hosting Funtastic Friday! These are gorgeous, Wendy! Pinning to 2 boards on Pinterest and sharing on the Hearth and Soul Facebook page. I was so pleased to learn about the Cup of Joe programme. I wonder if it can be done from countries other than the US. I will have to look into it. Thank you for sharing, Wendy, and for being a part of the Hearth and Soul Link Party. I appreciate all your support! Thanks, April, for you kind words and for the pinning! Cup of Joe is purchased online, so anyone from anywhere can participate! It is truly humbling that such a low cost and simple gesture can have such a positive impact on someone’s life! Those have to be hands down the most delicious and gorgeous cookies I have ever seen! I cannot wait to try these! Wendy, besides the cookies looking amazing, so beautiful, your Act of Kindness and a cup of joe program sounds wonderful. I have shared on Pinterest Twitter and Facebook to spread the word. I will be visiting “Cup Of Joe” immediately. Thank you for continually talking about the military and the need to show support! God bless you!! Happy Valentines!! And be sure to share about Cup of Joe on #omhgww. Wendy these are beautiful! Pinned! Thanks for sharing at the What’s for Dinner party. Can’t wait to see what you’ll bring this week!